For the earlier naval battle, see Battle of Copenhagen (1801). 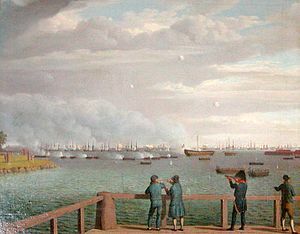 The Second Battle of Copenhagen (or the Bombardment of Copenhagen) (16 August – 5 September 1807) was a British bombardment of the Danish capital, Copenhagen in order to capture or destroy the Dano-Norwegian fleet, during the Napoleonic Wars. The incident led to the outbreak of the Anglo-Russian War of 1807, which ended with the Treaty of Örebro in 1812. Danish navy surrendered to the United Kingdom. Britain's first response to Napoleon's Continental system was to launch a major naval attack on the weakest link in Napoleon's coalition, Denmark. Although ostensibly neutral, Denmark was under heavy French and Russian pressure to pledge its fleet to Napoleon. In September 1807, the Royal Navy bombarded Copenhagen, seizing the Danish fleet, and assured use of the sea lanes in the North Sea and Baltic Sea for the British merchant fleet. A consequence of the attack was that Denmark did join the war on the side of France, but without a fleet it had little to offer. The attack gave rise to the term to Copenhagenize. It is also considered the first "terror bombardment" by a foreign power on a civilian target with no military objective. Despite the defeat and loss of many ships in the first Battle of Copenhagen in 1801, Denmark-Norway, possessing Jutland, Norway, Greenland, Schleswig-Holstein, Iceland, and several smaller territories, still maintained a considerable navy. The majority of the Danish army, under the Crown Prince, was at this time defending the southern border against possible attack from the French. There was concern in Britain that Napoleon might try to force Denmark to close the Baltic Sea to British ships, perhaps by marching French troops into Zealand. The British believed that access to the Baltic was "vitally important to Britain" for trade as well as a major source of necessary raw materials for building and maintaining warships, and that it gave the Royal Navy access to help Britain's allies Sweden and (before Tilsit) Russia against France. The British thought that after Prussia had been defeated in December 1806, Denmark's independence looked increasingly under threat from France. George Canning's predecessor as Foreign Secretary, Lord Howick, had tried unsuccessfully to persuade Denmark into a secret alliance with Britain and Sweden. On 21 January 1807, Lord Hawkesbury told the House of Lords that he had received information from someone on the Continent "that there were secret engagements in the Treaty of Tilsit to employ the navies of Denmark and Portugal against this country". He refused to publish the source because he said it would endanger their lives. The reports of French diplomats and merchants in northern Europe made the British government uneasy, and by mid-July the British believed that the French intended to invade Holstein in order to use Denmark against Britain. Some reports suggested that the Danes had secretly agreed to this. The Cabinet decided to act, and on 14 July Lord Mulgrave obtained from the King permission to send a naval force of 21 to 22 ships to the Kattegat for surveillance of the Danish navy in order to pursue "prompt and vigorous operations" if that seemed necessary. The Cabinet decided on 18 July to send Francis Jackson on a secret mission to Copenhagen to persuade Denmark to give its fleet to Britain. That same day, the Admiralty issued an order for more than 50 ships to sail for "particular service" under Admiral James Gambier. On 19 July, Lord Castlereagh, the Secretary of State for War and the Colonies, ordered General Lord Cathcart at Stralsund to go with his troops to the Sound where they would get reinforcements. During the night of 21/22 July, Canning received intelligence from Tilsit that Napoleon had tried to persuade Alexander I of Russia to form a maritime league with Denmark and Portugal against Britain. Spencer Perceval, the Chancellor of the Exchequer, wrote a memorandum setting out the government's case for sending forces to Copenhagen: "The intelligence from so many and such various sources" that Napoleon's intent was to force Denmark into war against Britain could not be doubted. "Nay, the fact that he has openly avowed such intention in an interview with the E[mperor] of R[ussia] is brought to this country in such a way as it cannot be doubted. Under such circumstances it would be madness, it would be idiotic... to wait for an overt act". The British assembled a force of 25,000 troops, and the vanguard sailed on 30 July; Jackson set out the next day. Canning offered Denmark a treaty of alliance and mutual defence, with a convention signed for the return of the fleet after the war, the protection of 21 British warships and a subsidy for how many soldiers Denmark kept standing. On 31 July, Napoleon ordered Talleyrand to tell Denmark to prepare for war against Britain or else Jean-Baptiste Bernadotte would invade Holstein. Neither Talleyrand nor Jackson persuaded the Danes to end their neutrality, so Jackson went back to the British fleet assembled in the Sound on 15 August. The British published a proclamation demanding the deposit of the Danish fleet; the Danes responded with "what amounted to a declaration of war". On 12 August, the 32-gun Danish frigate Frideriksværn sailed for Norway from Elsinor. Admiral Lord Gambier sent the 74-gun third rate Defence and the 22-gun sixth rate Comus after her, even though war had not yet been declared. Comus was much faster than Defence in the light winds and so outdistanced her. On 15 August, Comus caught Frederiksværn off Marstrand and captured her. The British took her into service as HMS Frederikscoarn. 1st Brigade : Colonel du Plat, 6th, 7th, 8th Line Batts. 2nd Brigade : Colonel von Drieburg, 3rd, 4th, 5th Line Batts. 3rd Brigade : Colonel von Barsse, 1st and 2nd Line Batts. 4th Brigade : Colonel von Alten, 1st and 2nd Light Batts. On 26 August, General Wellesley was detached with his reserve and two light brigades of British artillery, as well as one battalion, eight squadrons and one troop of horse artillery from the King's German Legion (KGL) to disperse a force which had been sent to relieve the beleaguered city. On 29 August, at the rivulet of Køge, this significant British force swiftly overpowered the Danish troops, which amounted to only three or four regular battalions and some cavalry. The Danes rejected British demands, so the British fleet under Admiral Gambier bombarded the city from 2 to 5 September 1807. In addition to the military casualties, the British bombardment of Copenhagen killed some 195 civilians and injured 768. The bombardment included 300 Congreve Rockets, which caused fires. [a] Due to the civilian evacuation, the normal firefighting arrangements were ineffective; over a thousand buildings were burned. On 5 September, the Danes sued for peace, and the capitulation was signed on 7 September. Denmark agreed to surrender its navy and its naval stores. In return, the British undertook to leave Copenhagen within six weeks. Thus, on 7 September 1807 Peymann surrendered the fleet (eighteen ships of the line, eleven frigates, two smaller ships, two ship-sloops, seven brig-sloops, two brigs, one schooner and twenty-six gunboats). In addition, the British broke up or destroyed three 74-gun ships-of-the-line on the stocks, along with two of the ships-of-the-fleet and two elderly frigates. After her capture, one ex-Danish ship-of-the-line, Neptunos, ran aground and was burnt on or near the island of Hven. Then, when a storm arose in the Kattegat, the British destroyed or abandoned twenty-three of the captured gunboats. The British added the fifteen captured ships-of-the-line that reached Britain to the British Navy but only four — Christian VII 80, Dannemark 74, Norge 74 and Princess Carolina 74 — saw subsequent active service. On 21 October 1807, the British fleet left Copenhagen for the United Kingdom. However, the war continued until 1814, when the Treaty of Kiel was signed. Contemporary Danish painting of the battle seen from land. Copenhagen shelled on the night of 4 September. The news of what happened did not reach Canning until 16 September. He wrote to Rev. William Leigh: "Did I not tell you we would save Plumstead from bombardment?" One week later he wrote: "Nothing ever was more brilliant, more salutary or more effectual than the success [at Copenhagen]" and Perceval expressed similar sentiments. The Times said that the confiscation of the Danish fleet was "a bare act of self-preservation" and noticed the short distance between Denmark and Ireland or north-east Scotland. William Cobbett in his Political Register wrote that it was "vile mockery" and "mere party cavilling" to claim that Denmark had the means to preserve her neutrality. William Wilberforce MP said the expedition could be defended on grounds of self-defence. Thomas Grenville wrote to his brother Lord Grenville that he could not help feeling "that in their [the government's] situation we should very probably have given the same order without being able to publish to Parliament the grounds on which we had believed in the hostile mind of Denmark". Lord Erskine condemned it by saying "if hell did not exist before, Providence would create it now to punish ministers for that damnable measure". The opposition claimed the national character was stained and Canning read out in Parliament the previous administration's plans in 1806 to stop the Portuguese navy falling into the hands of France. Canning and Castlereagh wished to hold Zealand and suggested that when the British evacuated it as part of the peace they should immediately occupy it again. This was strongly opposed by Sir Arthur Wellesley, however, and it did not happen. The opposition claimed that the attack had turned Denmark from a neutral into an enemy. Canning replied by saying that the British were hated throughout Europe and so Britain could wage an "all-out maritime war" against France without worrying who they were going to upset. The opposition did not at first table a vote of censure on the battle and instead on 3 February 1808 demanded the publication of all the letters sent by the British envoy in Denmark on information regarding the war-readiness of the Danish navy. Canning replied with a three-hour speech which Lord Palmerston described as "so powerful that it gave a decisive turn to the debate". Lord Howick said the speech was "eloquent and powerful" but that it was an "audacious misrepresentation" and "positive falsehood" of the correspondence between himself and Benjamin Garlike. The three motions on this subject were heavily defeated and on 21 March the opposition tabled a direct motion of censure on the battle. It was defeated by 224 votes to 64 after Canning made a speech "very witty, very eloquent and very able". The British bombardment frustrated the first attempt to publish a modern edition of the Anglo-Saxon poem Beowulf as the subsequent fire destroyed the 20-year work of scholar Grímur Jónsson Thorkelin. Two manuscripts, however, were recovered and Thorkelin eventually published the poem in 1815. Lieutenant-General Lord Cathcart arrived in the Africaine on 12 August to take command of the ground forces. Triton 24 – not sailed to Britain, but deemed useless and burnt on Saltholm or the Swedish coast. Aalborg, Arendal, Assens, Christiansund, Flensborg, Frederiksund,Helsingør, Kallundborg, Langesund, Nakskov, Middelfart, Odense, Roskilde, Rødbye, Saltholmen, Staværn, Svendborg, and Wiborg. The Norwegians or Danes recovered and returned to naval service six gunboats (Faaborg, Holbek, Kjerteminde, Nestved, Nysted and Nykjøbing) abandoned or stranded in the Kattegat. Stubbekjøbing had been destroyed by a mortar fired from the land at Svanemølle Bay on 26 August. ^ Various accounts say that between 10,000 and 120,000 rockets were launched. Congreve, who was present in Copenhagen, stated that "only 300 were fired"; other documents agree with these numbers. ^ The order came from the Crown Prince because the King, Christian VII of Denmark, was not mentally stable. ^ In total, 126 British ships (listed in the reference) were awarded prize money at the rate of £3 8s per able seaman and £22 11s per petty officer for their presence on 7 September 1807 at Copenhagen. The initial listing in the London Gazette names almost all of the ships, once one adjusts for ad hoc translations of names from Danish to English, and for transliterations. This initial list does not include the frigate Nymphen, the two brigs Allart and Delphinen, the schooner Ornen, or the gunboat Stege. Though it mentions that twenty-five gunboats were taken, it does not list them by name. ^ In 1809 there was a plan to give almost all of captured vessels more traditional British warship names, but this plan was later cancelled, and most Danish vessels retained their original names, or at least, anglicised versions thereof, until they were broken up. ^ a b Smith 1998, p. 254. ^ Hinde 1973, p. 169. ^ Hansard 1808, col 28. ^ Hinde 1973, p. 171. ^ Hinde 1973, p. 170. ^ Hinde 1973, p. 170–171. ^ Hinde 1973, p. 173. ^ Hinde 1973, p. 174. ^ James 1837, pp. 226228. ^ "No. 16062". The London Gazette. 5 September 1807. p. 1157. ^ Ludvig Flamand, Kjøbenhavns Bombardement 1807, Copenhagen, 1860, p. 27-28. In Danish. ^ Munch-Petersen 2007, pp. 171-172. ^ Fortsecue 1910, pp. 64–65. ^ Fortsecue 1910, pp. 70–72. ^ Munch-Petersen 2007, p. 206. ^ a b Hinde 1973, p. 175. ^ Hinde 1973, pp. 177–178. ^ Hinde 1973, p. 186. ^ Hinde 1973, p. 188. ^ Garnett 2008, p. 27. ^ "No. 16275". The London Gazette. 11 July 1809. p. 1103. ^ "No. 16067". The London Gazette. 16 September 1807. p. 1232. ^ Munch-Petersen 2007, pp. 215-216. Individual record cards in Danish for ships of the Danish Royal Navy used to be found on the internet at Orlogmuseet Skibregister, but this is now a dead link (from February 2013). A new Danish naval Museum website listing for ships is available here linking to a page of ships' names for which there is data.